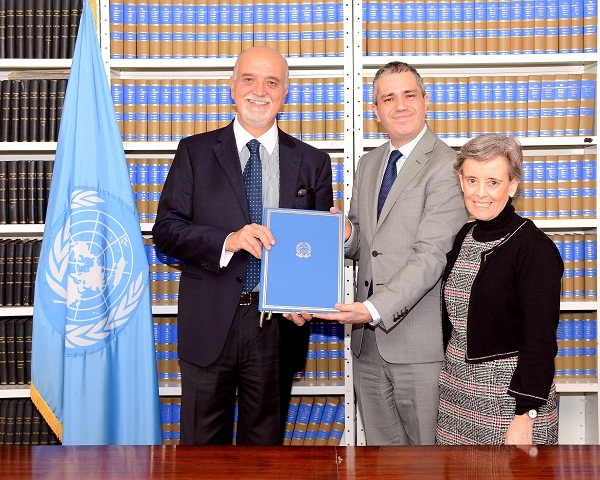 New York, 4 February 2016 - "I warmly welcome today's ratification by Italy of this important child rights treaty. With this significant step, 25 countries have now ratified the the Optional Protocol on a Communications Procedure and 50 have signed it." said Marta Santos Pais at the signing ceremony. The Protocol allows children to bring complaints to the United Nations Committee on the Rights of the Child on violations of their rights. To support the process of ratification and to ensure that the protocol is understandable for children, the Office of the SRSG has developed an advocacy tool. Since the adoption of the Optional Protocol by the UN General Assembly, on 19 December 2011, the ratification process has gathered significant momentum and a wide public support received from regional organizations, UN Agencies and civil society. "The Optional Protocol remains a high priority for my mandate and I call on all Governments to consider its urgent ratification." added SRSG Santos Pais.